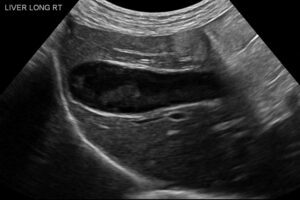 Welcome to our series of articles on small animal abdominal ultrasonography. 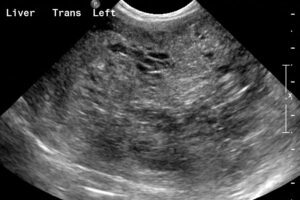 The initial articles provided an overview of basic ultrasonography principles and a discussion about how to perform a sonographic tour of the abdomen. 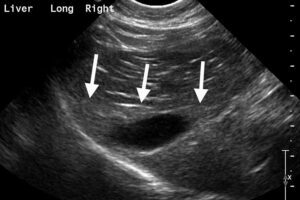 This article—and the rest of the series—will discuss ultrasound evaluation of specific abdominal organs/systems, including scanning principles, normal sonographic appearance, and identification of common abnormalities seen during ultrasound examination. A Tour of the Abdomen: Part 1 (January/February 2016) and Part 2 (March/April 2016). When using the systematic approach described in previous articles, the sonographic tour of the abdomen begins in the cranial abdomen, evaluating the liver and gallbladder. 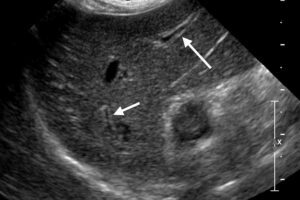 This article reviews the normal ultrasound appearance of the liver and gallbladder, steps for obtaining appropriate views, and some common abnormalities seen with ultrasonography of these organs. In Part 2, causes of generalized hepatic changes and the ultrasound appearance of biliary abnormalities will be reviewed. Complete evaluation of the liver requires extensive examination of all aspects of the liver and may also necessitate both standard transabdominal and intercostal (between the ribs within the intercostal space) approaches. Evaluation consists of longitudinal (sagittal and parasagittal) and transverse images of all aspects of the liver (right side, midline, and left side of the liver). Clip the hair and apply acoustic gel at a level just caudal to the xiphoid process. With the patient in dorsal or lateral recumbency, place the probe just caudal to the xiphoid process. Begin the examination with the transducer in a long-axis plane and angle it cranially to view the midsection of the liver. Caudate lobe, including the caudate and papillary processes. FIGURE 1. Anatomy of the canine liver (caudal or visceral aspect), with the lobes, porta hepatis, caudal vena cava, and gallbladder identified. Illustration by Pamela Boutilier, DVM, MVSc, Diplomate ACVIM (Small Animal Internal Medicine), SAA. 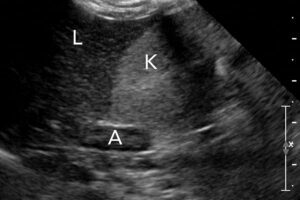 The hepatic lobes cannot be distinguished with ultrasonography. However, when significant abdominal effusion is present, the divisions between the hepatic lobes become more apparent. In dogs, the liver’s left lobe (medial sublobe), quadrate lobe, and right lobe (medial sublobe) encircle the gallbladder. The caudate lobe extends dorsally and caudally, ending with the renal fossa, which contains the cranial pole of the right kidney. 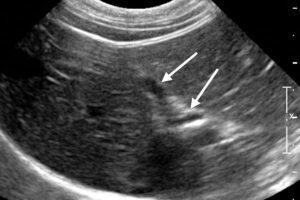 The liver parenchyma has a coarse echotexture, and portal vessels are the dominant vascular structure noted throughout the liver (Figure 2). The hepatic and portal veins form specific divisions to each of the liver lobes. The porta hepatis is the central portion of the liver to the right of midline where the portal vein, hepatic artery, and bile duct (see Gallbladder Evaluation) enter and exit the liver. The portal vein is the easiest structure of these 3 to identify. The hepatic artery is smaller and easier to identify using color flow imaging. 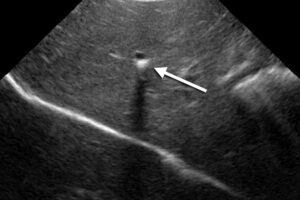 The bile duct is not seen in dogs, but may be visible in cats (up to 3 mm in diameter) in the porta hepatis region. FIGURE 2. Long-axis image of a canine liver. The hyperechoic line along the left side of the image represents the lung–diaphragm interface; the arrows mark the hyperechoic portal vessels. The portal vein then continues as the left divisional branch into the left lobe of the liver. The hepatic veins drain dorsally and to the right into the caudal vena cava (Figure 3). 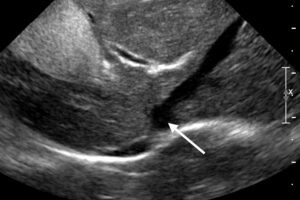 They can be seen as hypoechoic tubular structures that do not have hyperechoic walls; the vessels taper toward the periphery of the liver and enlarge centrally within the liver. The hepatic veins enter into the caudal vena cava in the dorsal right liver along the ventral and lateral wall of the caudal vena cava. FIGURE 3. 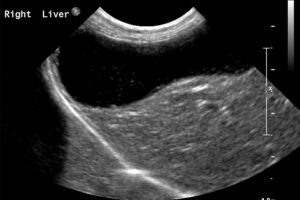 Transverse midline image of a canine liver. The echogenic oval on the left side of the image is hyperechoic material within the gallbladder. The hypoechoic vessel on the right side of the image is the left hepatic vein, which drains into the caudal vena cava (arrow). 1. With the transducer in the subxiphoid position, angle it to the left to evaluate the left lobe in the long-axis plane, with the diaphragm–lung interface (a bright hyperechoic line) noted along the cranial border of the liver (Figure 2). The fundic portion of the stomach is just caudal (Figure 4) to the left lobe of the liver. FIGURE 4. Long-axis image from a dog (the cranial side is the left side of the image). The falciform ligament and fat are in the near field, and the liver is deep on the left. The stomach (on the right side of the image) is relatively empty, with gas inside the gastric wall and reverberation artifact extending from the stomach. 2. Angle the transducer back to midline and then toward the right side of the patient to image the gallbladder (Figure 5). FIGURE 5. Long-axis image from the right side of the abdomen of an adult dog. 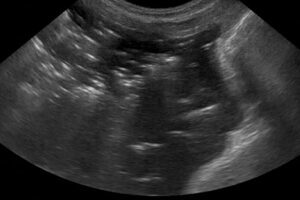 Echogenic material can be seen in the gallbladder, which is normal in cats. 3. Angle the transducer back to midline, and rotate it 90 degrees, with the notch pointing toward the patient’s right side. Then angle the probe ventrally and dorsally to see the entire extent of the liver. 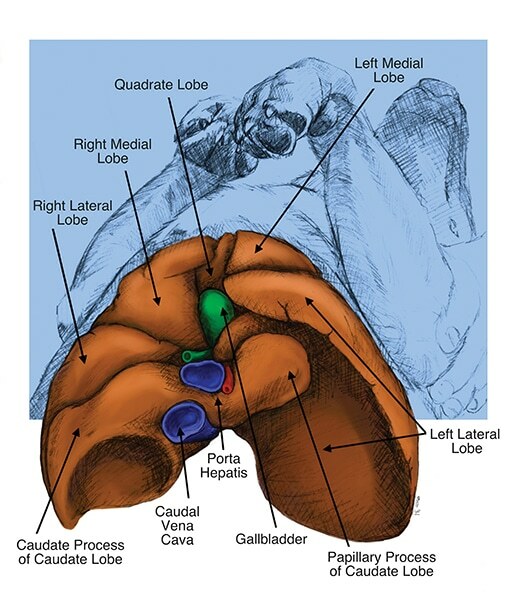 Dividing the liver into thirds ensures evaluation of all 3 sections: right side, midline, and left side (Figure 6). Laterally and caudally, the liver extends to the level of the spleen on the left; dorsally, the liver extends to the level of the right kidney on the right (Figure 7). FIGURE 6. Dog in dorsal recumbency; the ultrasound transducer is in the short-axis imaging plane, with the notch pointing to the right in a midline position (A). Transverse image obtained from the left side of the dog (B): the spleen (S) is in the near field on the right side of the image. Transverse image from the same dog with the gallbladder on the left side of the image (right side of the dog) (C); the bright echogenic line in the far field is the lung–diaphragm interface. FIGURE 7. Long-axis dorsal plane image, with the notch of the transducer pointing toward the cranial aspect of the dog. The caudate lobe of the liver (L) can be seen, with the renal fossa in the same area as the right kidney (K). The right adrenal gland (A) is in the far field. Fat within the falciform ligament is seen in the near field, particularly in cats. Often the fat is isoechoic to the liver, and it can be difficult to delineate between the hepatic parenchyma and the falciform ligament (Figure 8). FIGURE 8. 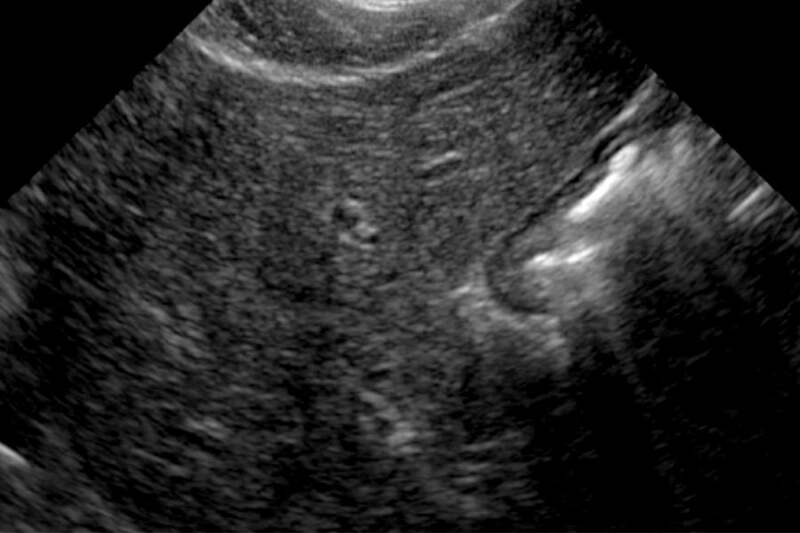 Long-axis view in a cat in which the fat in the falciform ligament (near field) is slightly hypoechoic relative to the liver (far field). The arrows indicate the demarcation between the falciform fat (near field) and the liver parenchyma (far field). A “window” that is often used to evaluate dogs and cats with suspected portosystemic shunts is a transverse imaging plane between the dorsal right 11th and 12th intercostal spaces. This window allows visualization of the relationship between the porta hepatis and the aorta, caudal vena cava, and portal vein (Figure 9). FIGURE 9. 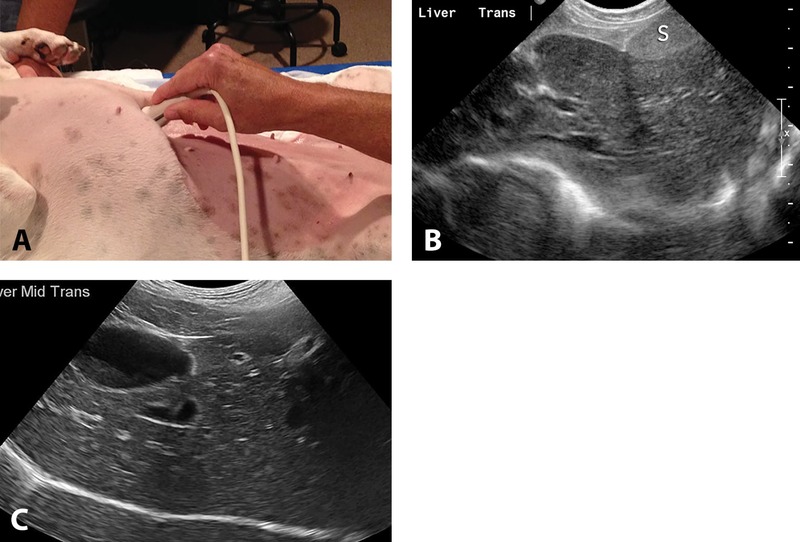 Dog in dorsal recumbency, with the ultrasound transducer positioned in a transverse imaging plane at the level of the 11th intercostal space and the notch pointing dorsally (A); in this image of the same dog (B), the aorta (AO), caudal vena cava (CVC), and portal vein (PV) can be seen in cross-section from the left to right side. The gallbladder is located to the right of midline. The volume of bile noted within the gallbladder is variable. Fasting and anorexia result in gallbladder distension. In cats, the gallbladder can be bilobed (Figure 10). FIGURE 10. A bilobed liver is a normal anatomic variant in cats. Long-axis image showing 2 chambers associated with the same gallbladder (A); short-axis image from a different cat showing 2 compartments stacked on each other (B). FIGURE 11. Parasagittal (long-axis) image of a normal canine gallbladder, with a small area of echogenic material seen in the gallbladder. In dogs, the cystic and bile ducts are not visible; however, feline cystic and bile ducts can be visualized sometimes, and can measure up to 3 mm in diameter each (Figure 12). FIGURE 12. Transverse (short-axis) oblique image from a cat of the cranial right abdomen caudal to the level of the gallbladder (cat’s right side is on the left side of the image). The tubular structures are the cystic duct and bile duct (arrows); these ducts measure 2 to 3 mm in diameter and are normal in cats. Echogenicity: Anechoic, hypoechoic, hyperechoic, and/or heteroechoic. Generalized abnormalities will be discussed in Part 2 of this article. Focal and multifocal nodules are < 3 cm, and can be anechoic, hyperechoic, hypoechoic, and/or heteroechoic, with a target lesion appearance (Figure 13). Target lesions are nodules with hyperechoic centers and hypoechoic rims. These lesions are often metastatic, particularly if there are multiple target lesions in several abdominal organs (liver, spleen, kidneys). Due to the overlap in ultrasound appearance between benign and malignant lesions, either cytology or histology is needed for a final diagnosis. FIGURE 13. Transverse (short-axis) image of a dog showing a hypoechoic nodule in the left liver lobe (A); on cytology, it was determined to be nodular regeneration. Long-axis image of a dog showing a hyperechoic nodule in the left liver lobe; the cytologic diagnosis was extramedullary hematopoiesis (B). Multiple target lesions (hypoechoic rim and hyperechoic center) seen within a long-axis view of the left liver lobe (C); on cytology, this was determined to be histiocytic sarcoma. Hepatic masses can be complex, with hyperechoic and hypoechoic features and areas of cavitation consistent with necrosis (Figure 14). These lesions can become quite large and create a cranial abdominal mass effect on abdominal radiographs. A large hepatic mass is most commonly a primary hepatic tumor, with varying grades of malignancy (from hepatoma to hepatocellular carcinoma). FIGURE 14. Transverse image from the left side of a 10-year-old spayed female dog in which a hyperechoic liver mass is present (> 5 cm in diameter), with some areas of cavitation noted in the near field. On histology, this mass was shown to be a hepatocellular carcinoma. In cats, cystic adenomas and adenocarcinomas are common and have a hypoechoic appearance with multifocal cystic areas (Figure 15). Other tumors that can cause single or multiple hepatic masses include lymphoma, histiocytic sarcoma, and hemangiosarcoma. Any large tumor mass in the liver can result in hemorrhage and peritoneal effusion. FIGURE 15. Sagittal (long-axis) image from the right side of the cranial abdomen in a cat. A large (4 × 5 cm) hyperechoic mass can be seen in the cranial abdomen. On histology, the mass was shown to be a cystic adenocarcinoma of the liver. Primary tumors of the liver are often large, hyperechoic masses. Other causes of focal or multifocal abnormalities include areas of mineralization (hyperechoic focus with distal shadowing) or intraparenchymal gas (hyperechoic focus with distal acoustic reverberation artifact). Focal mineralized choleliths in the intrahepatic biliary tree. FIGURE 16. Long-axis left-sided image from a dog. There is a focal area of mineralization (white arrow) with distal acoustic shadowing. Active hepatic disease was not seen at this time. In a liver abscess and liver lobe torsion (Figure 17). FIGURE 17. Transverse image from the cranial left abdomen of a dog. Note the large hypoechoic mass with multiple areas of speckled increased echogenicity consistent with gas. At surgery, a liver lobe torsion with necrosis was identified; anaerobic infection was found on culture. Protected by the caudal ribs. Echogenic material within it that varies, depending on the species and the patient (Figure 5). 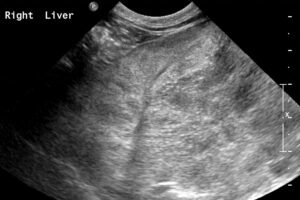 Liver evaluation takes time, with both intercostal and intraabdominal approaches often needed. 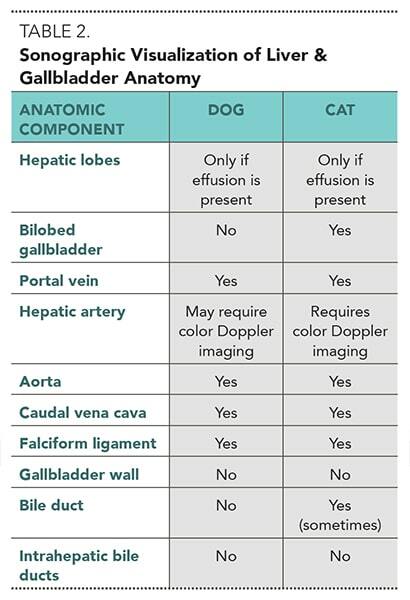 It is important to note both the structures that can, and cannot, be visualized in the liver and gallbladder (Table 2). Cuccivillo A, Lamb CR. 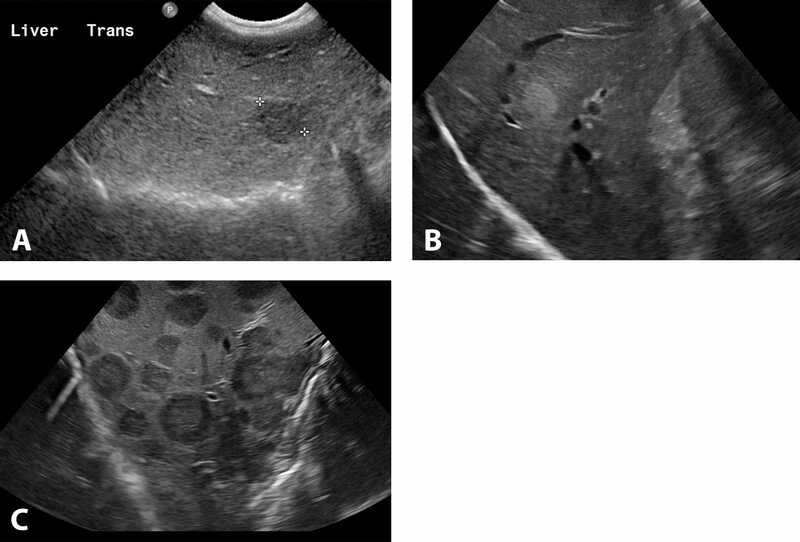 Cellular features of sonographic target lesions of the liver and spleen in 21 dogs and cats. Vet Radiol Ultrasound 2002; 43(3):275-278. Mattoon J, Nyland T. Small Animal Abdominal Ultrasound, 3rd ed. Philadelphia: Elsevier, 2014. Penninck D, d’Anjou M. Atlas of Small Animal Abdominal Ultrasound, 2nd ed. Ames, IA: Wiley Blackwell Publishing, 2015.